A test drive is just a test drive...unless it's a $5,000 Test Drive at Steve Padgett's Danville Honda! Here, a scheduled test drive isn't just an opportunity to learn more about a new Honda or quality pre-owned vehicle from a professional, knowledgeable, and friendly sales consultant, it's your Chance to win $5,000! That's right! 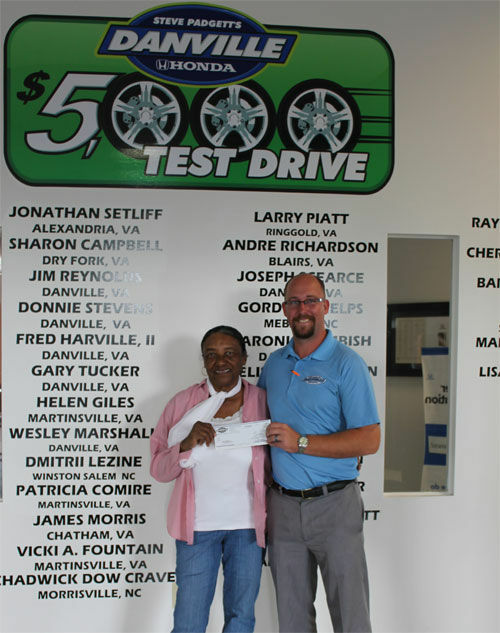 A scheduled test drive at Steve Padgett's Danville Honda could win you $5,000! Simply schedule your test drive, visit our dealership, take a test drive in any new or pre-owned vehicle, and tell your sales consultant you wish to register for our $5,000 Test Drive. It's really that simple!